Today, March 30, we celebrate Vincent van Gogh’s birthday; 2015 is an especially poignant year as it marks 125 years since his death. Van Gogh, a painter whom Duncan Phillips admired throughout his entire collecting career, was celebrated for his modern expressionist painting style. Phillips wrote plenty about his technique, describing him uniquely as, “by turns, Japanese and Gothic.” As an art connoisseur who often drew unprecedented connections, Phillips’s statement may seem farfetched. But in examining one of Van Gogh’s works juxtaposed with both a Japanese painting and a Gothic painting, it becomes clear what Phillips meant. 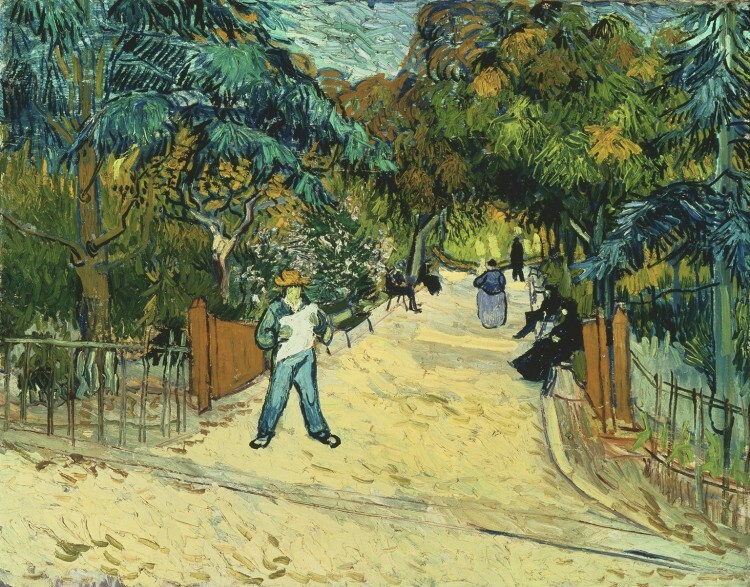 In his 1888 painting Entrance to the Public Gardens in Arles, Van Gogh utilizes his characteristic brushstrokes that are at times active and at others tranquil. In the foliage canopying the entryway into the gardens, there is a striking comparison to certain Japanese landscape paintings, such as one in the collection by Taro Yashima, Tree. Though he painted this work more than 50 years later, Yashima perfected the same short marks as Van Gogh’s that activate the singular tree as if it is blowing in the wind. 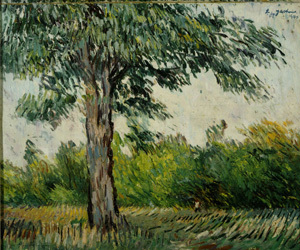 The contrastingly steady pattern of strokes in the grass bed below the tree ground Yashima’s piece with their regularity, just as the almost monochromatic beige in Van Gogh’s piece anchors the garden scene. The green and blue color palette employed by Van Gogh is also similar to that of Yashima, who relies on a neo-impressionist style of juxtaposing darker shades of green next to lighter shades rather than blending them together. Such comparisons make it seem likely that Japanese artists like Yashima may have looked to the masterpieces of the Dutch painter. Similarly, Gothic paintings collected by Duncan Phillips completed around the same time as Yashima’s Tree, such as Pietro Lazzari’s Gothic Still Life, evoke a similarly expressionist mood. 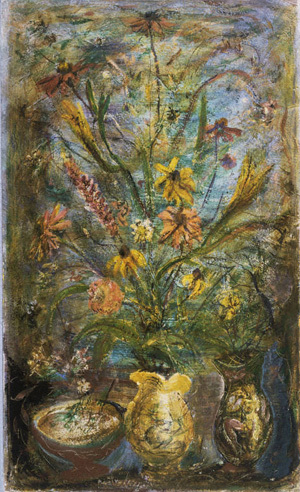 Rather than a landscape, however, Lazzari’s piece showcases a singular vase of flowers, taking over the canvas centrally and vertically. While the contour outlines typical of Van Gogh’s style are largely absent in Lazzari’s still life, the attention to natural detail with numerous short strokes of paint is apparent. With varying thicknesses of paint application atop the canvas, Lazzari calls attention to the 2D nature of the painting surface in the same way that Van Gogh does. Both Gothic Still Life and Entrance to the Public Gardens in Arles are not meant to be exact replicas of the scenes they depict, but rather they acknowledge the fact that these are simply distorted images of reality as interpreted by the artists. Such is a modern expressionist idea that was pioneered by masters like Van Gogh in the 19th-century, clearly replicated by 20th-century artists. But there is an inherent difference between Van Gogh’s Entrance to the Public Gardens in Arles and each of these later works. While Tree and Gothic Still Life are lacking any sort of human presence, Van Gogh’s piece showcases seven faceless figures, some of which are mere silhouettes receding into the background. Even the simple indication of life in this garden scene brings more expression to his painting than what is found in Yashima and Lazzari’s pieces. Van Gogh’s frontal figure dressed in blue reading what appears to be a newspaper gives his painting a story. We begin to wonder why this man is set apart from the people sitting on a bench reading. Is he waiting for someone? If yes, who for? We might wonder why the seated silhouettes have their heads down, and thus question their mood. And we wonder what the woman in the blue skirt is walking towards, and whether or not she has any connection to any of these other people. In this way, Van Gogh’s painting spearheads a dialogue that the works by Yashima and Lazzari do not, adding an element of life and mystery that is perhaps the reason Van Gogh is so celebrated. Happy Birthday, Mr. Van Gogh! This entry was posted in Experiment Station and tagged Abstract Expressionism, abstraction, artist birthdays, expressionism, leading art history figures, public gardens, Vincent Van Gogh. Bookmark the permalink.